I finally got around to reading Between Shades Of Gray, and I am totally kicking myself for not reading it earlier! 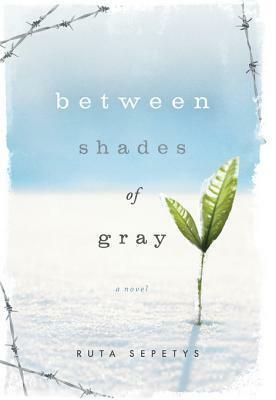 I just loved Between Shades Of Gray, and it’s a book I recommend to anyone who hasn’t read it! What I really loved about Between Shades Of Gray is that it follows Lina, who was sent to a work camp in Siberia. I don’t know why, but it’s different than what I was expecting for a novel that has WWII as a back-drop. There was a lot going on in World War II, and it was nice reading about a part of it that I vaguely knew about. Because it seems like a lot of the focus on WWII is on the Nazi’s and the Holocaust, and maybe D-Day and Pearl Harbor, which is understandable, but it’s also…other things happened to, and yet, they don’t seem to be talked about, so I was really intrigued with Between Shades Of Gray. At any rate, what was going on in Siberia and Russia seems so horrible, and I can’t even begin to imagine what that must have been like. I also like that Sepetys didn’t sugar-coat anything. It’s grim, and I was surprised that she didn’t hold back on some of the horrors that happened. Things aren’t horribly graphic or anything, but there are just enough details to show how horrible things really were. There is hope that things will get better, and you see flashbacks of what life was like for Lina before being sent to Siberia. I thought the flashbacks were interesting, and I liked seeing what Lina’s life was like before, but for some reason, I felt like Sepetys could have transitioned to them better. They really added to the book, though. And the characters were so special! There is an assortment of characters, and they were all so different, but they also made the story really come to life. I mean, they all had to endure something so completely horrible, and yet you saw a will to survive and get through it. Between Shades Of Gray is such a special book, and I’m really feeling like I cannot do it justice! It’s a great look at a side of WWII that I’m not familiar with at all. I still can’t believe it took me so long to read this book! What Lina and her family went through was so horrible, and I can’t even begin to imagine what that was like, and it’s definitely an eye-opener for me. Between Shades Of Gray gets 5 stars.